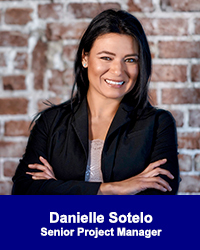 Danielle Sotelo - California Consulting, INC.
Ms. Sotelo is a San Joaquin Valley native and brings over 10 years of experience in grant writing, grant administration and program development for public and private entities. She has worked with California Consulting since 2008, and during this time she has helped to secure over $9M in funding for California Consulting clients. She has drafted and submitted many successful grant applications for different sectors, but she most enjoys writing in the areas of public safety, motorized and non-motorized transportation, urban greening, alternative fuels infrastructure, and education. Ms. Sotelo prides herself in paying close attention to detail and has logged 100’s of hours in project management. She is committed to securing federal, state and local funding to spur environmentally and socially conscious community development both domestically and internationally. Ms. Sotelo holds a BA in International Studies with an emphasis in Political Science and a certificate in Dispute Resolution from Pepperdine University.